April showers have arrived! I can’t stand the rain, but if there’s a bright side to rainy days, it’s definitely getting to wear my Hunter Boots… and a fun rain coat! 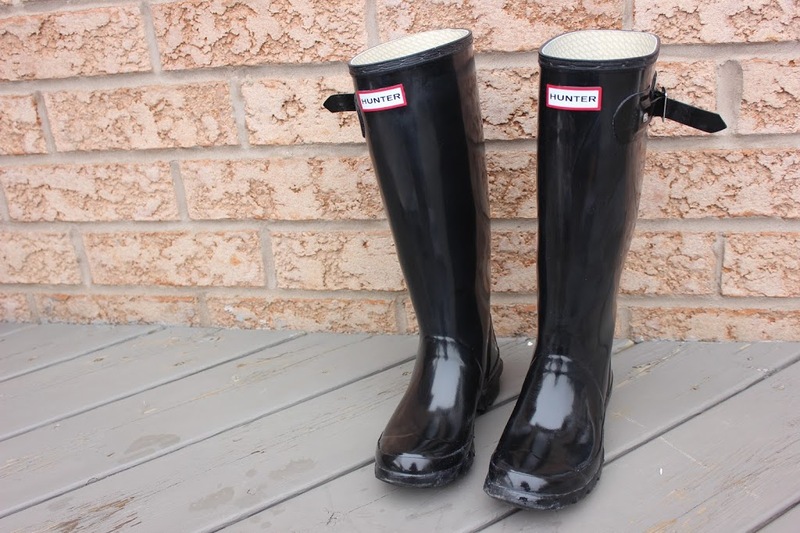 I bought my first pair of Hunter boots in the fall and really love them. 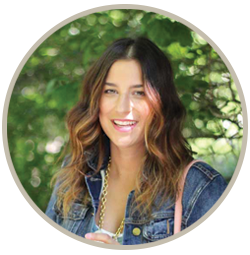 I’m very particular about keeping my footwear clean, and I love the fact that I’m able to wear my Hunter boots without a care in the world. I’m used to avoiding puddles and slush like the plague, so it’s nice to have some footwear that’s designed for these conditions. 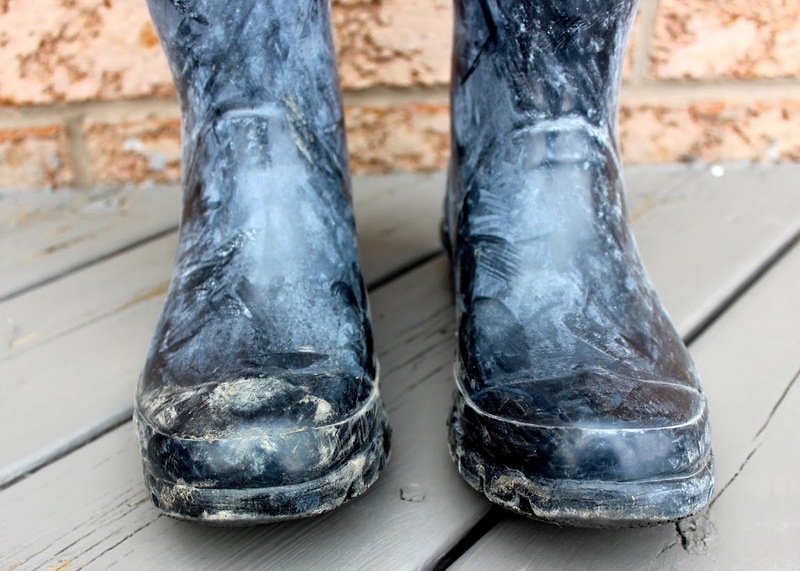 However, after a bit of wear, I started to notice the nice sheen was giving way to a white film on top of the boots. I shrugged it off at first, but as time went on, it got more noticeable, so it really started to bug me. Why were my pretty boots looking ratty? A quick Google search led me to the Hunter website, which had the explanation I was looking for. They refer to the white powdery substance as “blooming,” which is a normal process for natural rubber products, especially those of high quality. The white powder is made up of insoluble particles the rise to the surface of the rubber. This is why it doesn’t just rinse off in the rain. 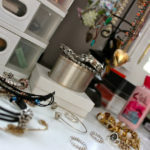 There are specialty cleaning products available to help you restore the original sheen…but why spend the money if you can clean them with things you have at home? 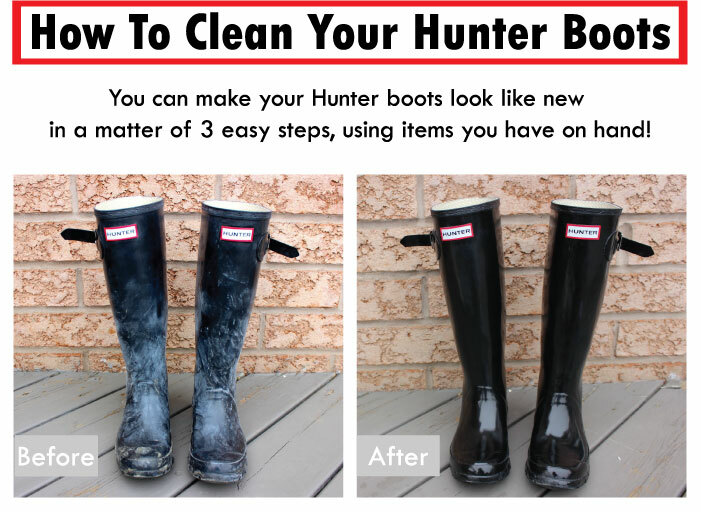 Without further ado, here’s a simple, DIY trick you can use when you’re trying to determine how to clean Hunter Boots. Grab a paper towel, and run it under warm water. Put some soap onto it, and lather up your boots. Once the boots are all soapy, rinse them off. They’ll look shiny, but trust me, once they dry, they’ll look pasty again! 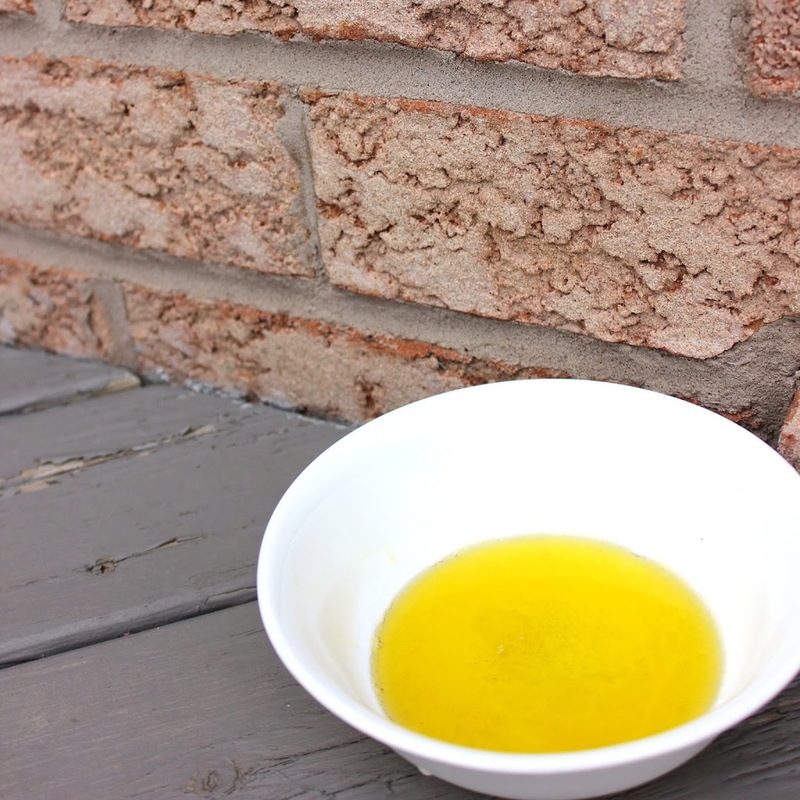 Grab a new paper towel and dip it into some Olive Oil. Then, go to town on your boots. 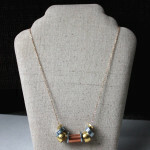 They’ll look shiny and will absorb the oil, so they won’t be greasy when you wear them. I hope this helps – let me know if you try it! This could not have come at a more perfect time! My hunters are looking awful from the salt! Thanks for sharing! That’s awesome! Olive oil. Who’d have thought? Thanks for the great tip!! 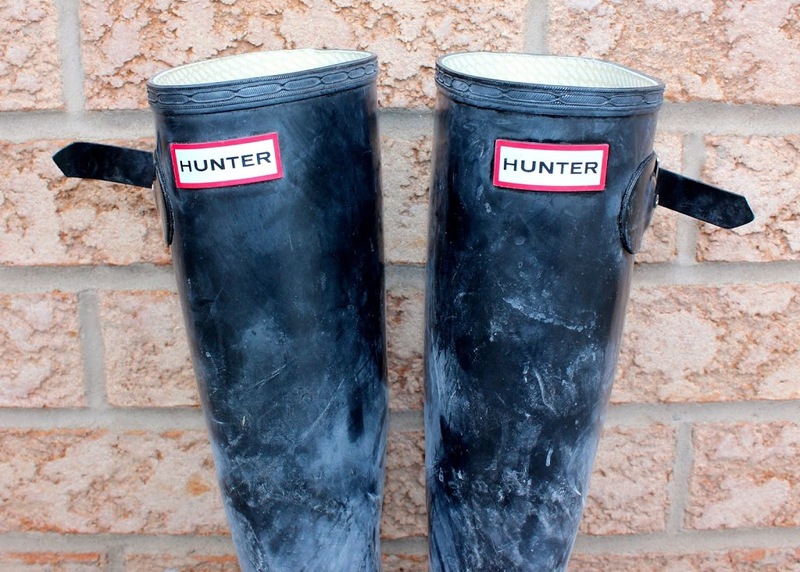 I got my first pair of Hunters at the beginning of the year, shortly after moving to Nova Scotia. I used to hate the rain, but now I actually look forward to it because I get to wear my awesome boots! I often end up wearing them to places like the dog park so they could definitely use a little loving! Olive oil. Gotcha. My boots are disgusting from snowy slush stains! This post just made my day! I have always been curious about this, but have admittedly been to lazy to look up how to clean them properly. Thanks so much for posting! Great tip! I hate buying products that are only good for one thing, so I’ll definitely try this! Must try!! 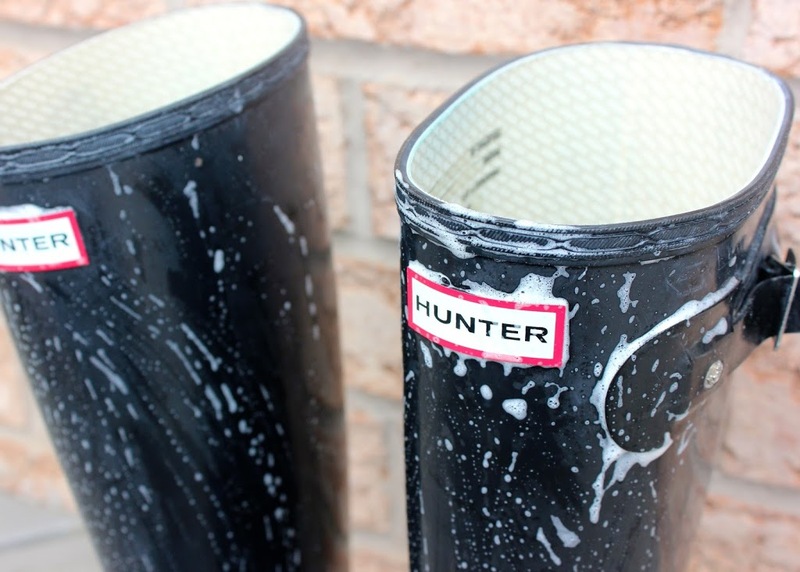 I thought my Hunter boots were doomed… They are all chalky and gross looking. Can’t wait to bring them back to life! Thanks for the tip! what, that’s so cool! thanks for sharing this! OMG! this is great – thank you for the tip, I will be trying this tonight!!!! THANK YOU! 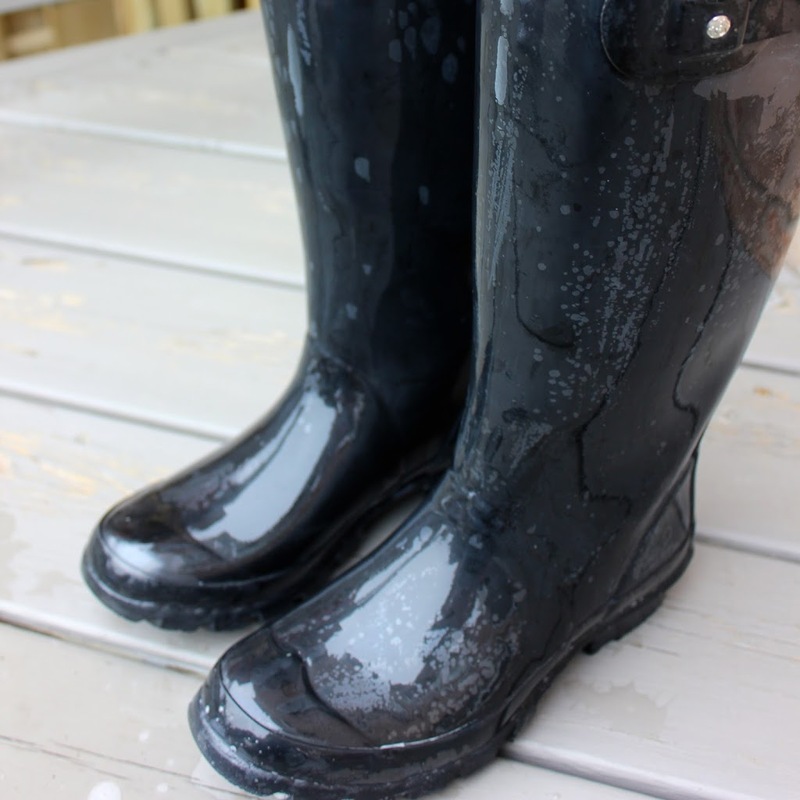 I have been needing to clean my rain boots and I have never been able to get them to look this good yet! Today I wore my new baby-blue boots to the dog park, which was the reason I bought them. Although I have washed all the mud off them, they have some definite dark brown marks and a slight scuffing on the sole. Finally I used a soft scrubbing brush but they seem stained. Is this normal? Oh no! I would be upset about that too. I wouldn’t expect them to be stained either. If I was you, I’d take some photos and get in touch with Customer Service. They’d be able to help better than I would. 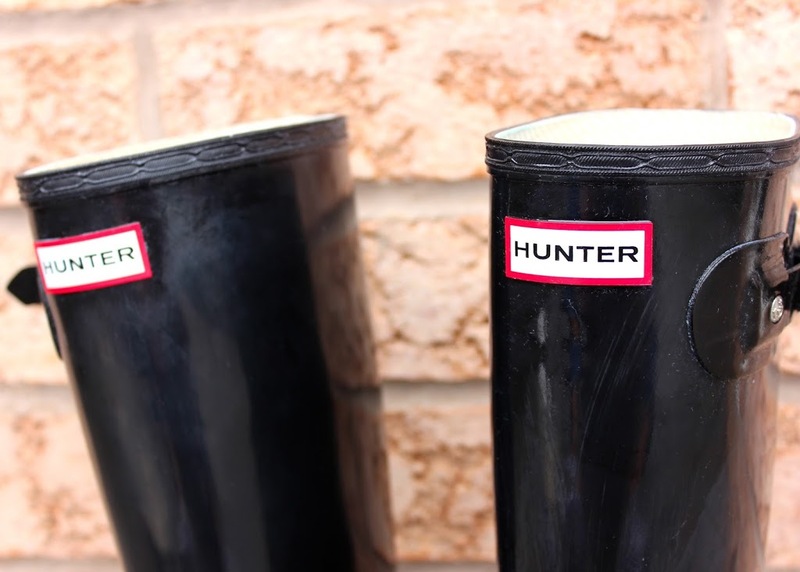 I’ve had my Hunter boots for a number of years now. They have cracked a little bit, and there’s some wear on the inside (by the back), but overall, I’m happy with them. They took a year or so before I noticed the cracks, but it’s not too bad. I hope that helps! Thanks for the reply! Just a couple more questions if you don’t mind me asking, sorry but I really want them and want to make sure I’m getting my money’s worth haha! Do the cracks prevent you from wearing them or does a lot of water get inside the boot or is it fine? Also, did you wear them in the winter? Thanks so much. No problem! I don’t mind at all. You are more than welcome to send me an email if you have any other questions. For me, the cracks are very slight. They definitely don’t prevent me from wearing them. They just look a bit worn. I’ve had them for like 5 years now and still wear them. I’ve never had them leak, so I think the cracks are more of an issue with appearance, rather than function. I DO wear the boots in winter, but it can get pretty cold, since they’re not insulated. You CAN buy Hunter boot socks for added warmth. I haven’t because I just prefer snow boots in the winter. Thanks so much girl! I read in your bio that you’re from Toronto so I know I can definitely trust your opinion on these boots and the Toronto weather! OMG my boots now look fab!! I love them and now they look as good as new and festival ready after lots of dog walking and muddy building sites. Thank you for the tip!! Coconut Oil works great as well! I like the work the oil into the boots with my hands first, and then wipe off with a paper towel. Works like a charm! I did everything you said, but there’s still a haze (not the white film, but a little haze) over my boots. Any suggestions? Hi Stacey, thanks for the comment! I’m not sure what’s causing the haze on your boots. I’d recommend trying another round of cleaning, to see if that helps?